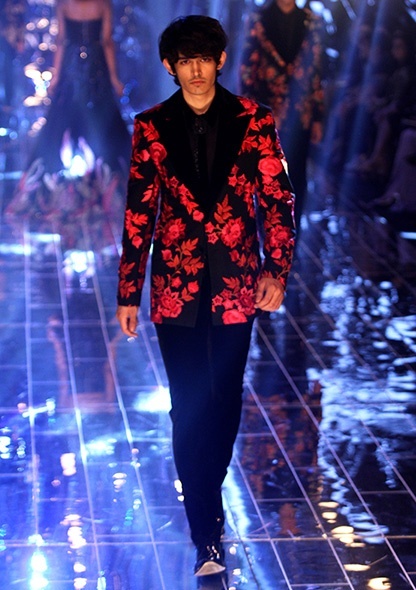 From an elaborate line of tuxedos and dinner jackets for men to a glamorous selection of cocktail dresses for women, ‘Tales of Indulgence’ recounted the sparkle and glamour of a night of celebration. 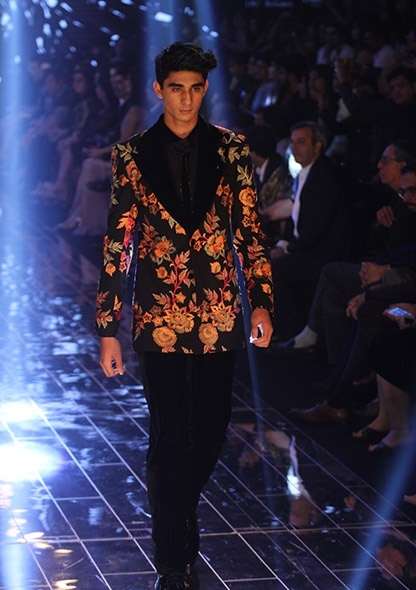 The collection followed the trail of revelry over the ages and across the world translating their nuances into ensembles, which are structured and playful at the same time. 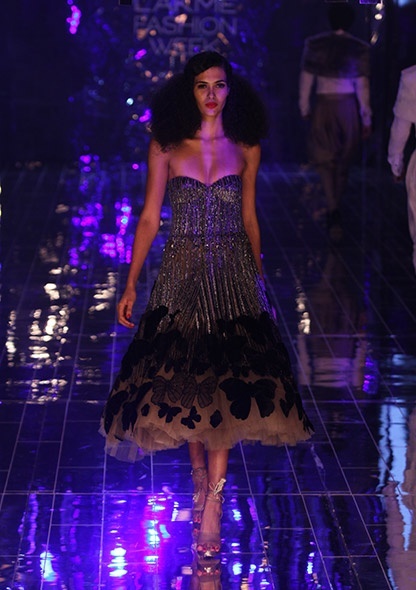 It brought out the Gatsby-esquedecadence of the roaring 1920’s, the sensuality of a Parisian burlesque and the hedonism from the depths of a night-club in the Mediterranean. 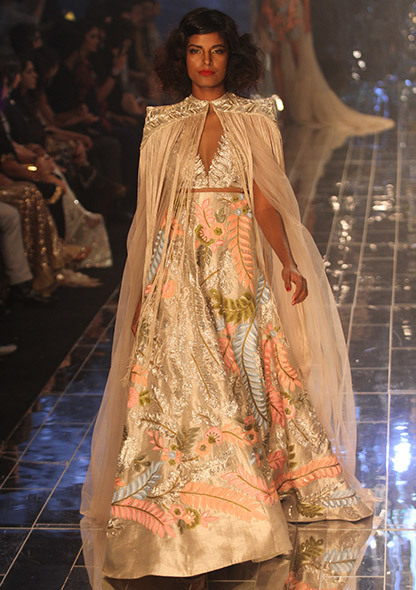 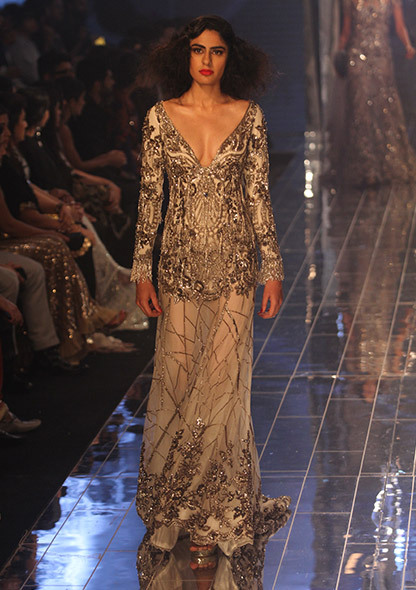 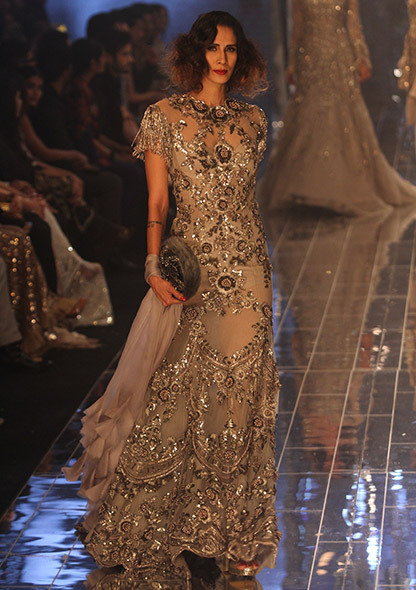 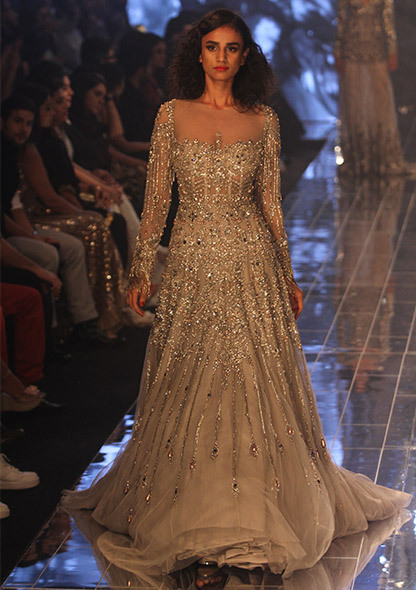 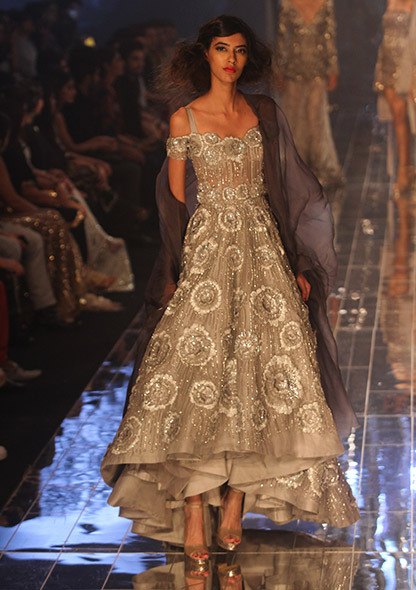 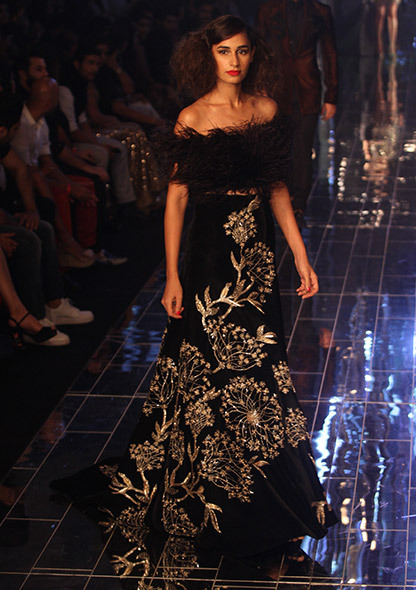 ‘Tales of Indulgence’presented its story in eloquent chapters full of play of colours, fabrics and silhouettes. 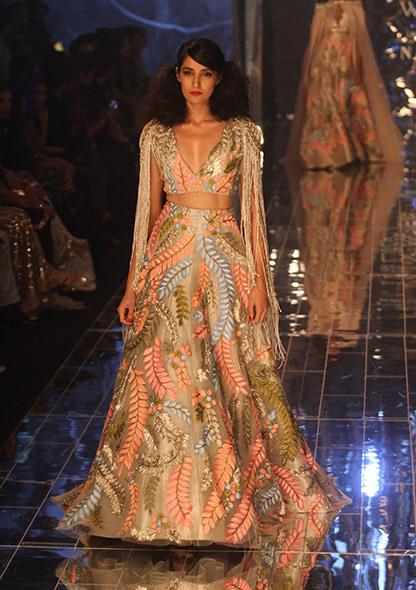 Much like the vibrant personality of its modern muses – vivacious yet demure, stoic and simple, traditional though steeped in modernity, the collection was a beautiful play of picture-perfect juxtapositions. 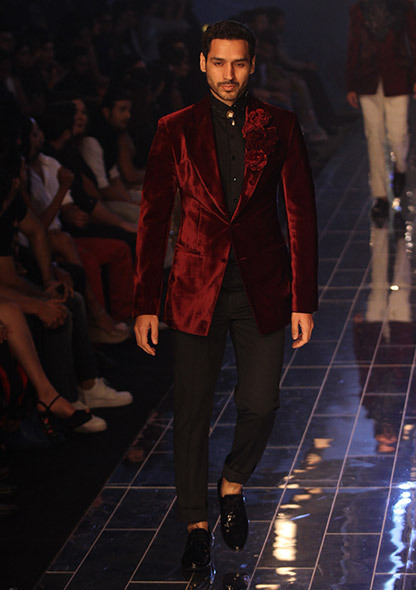 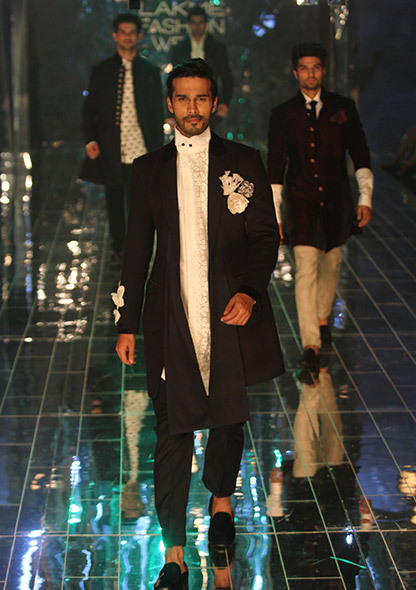 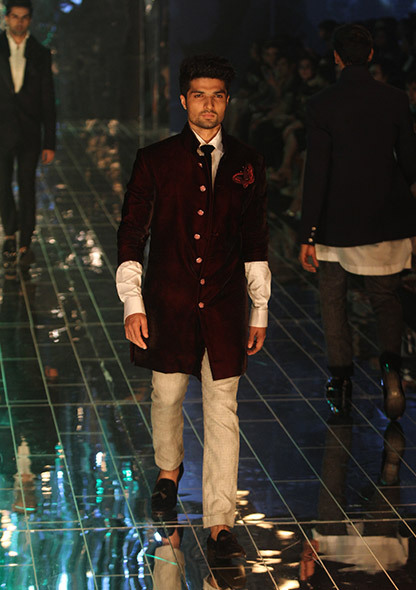 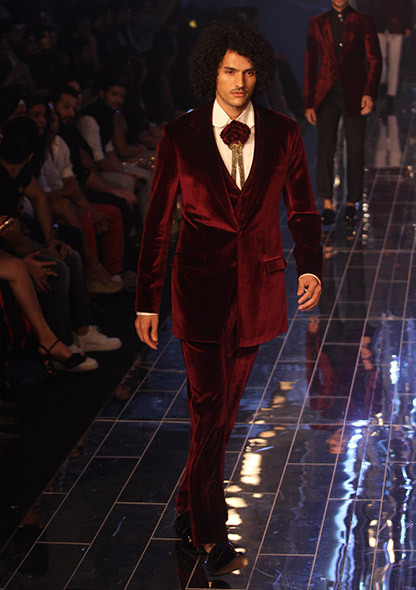 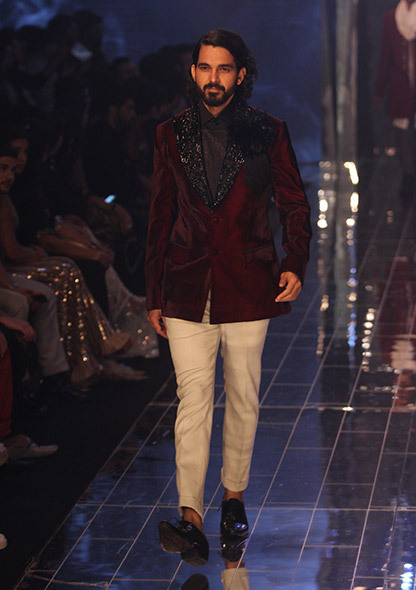 While the fabrics and silhouettes was an ode to contemporary sartorial sensibilities, the detailed embroidery spelt Indian craftsmanship.For the gentlemen, ‘Tales of Indulgence’ presented tailored dinner jackets worn with skinny pants and classic tuxedoes worn with edgy tulle bow-ties. 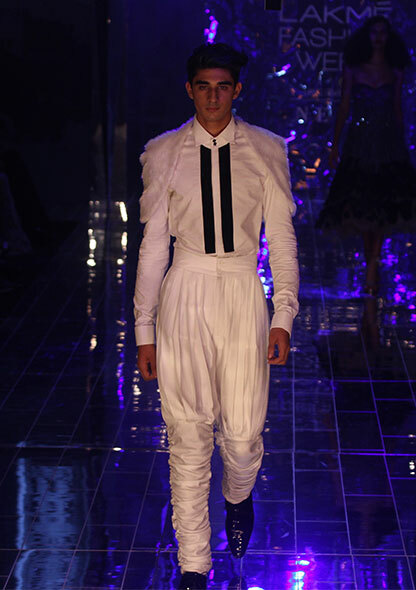 For the first time, the label introduced layering for men. 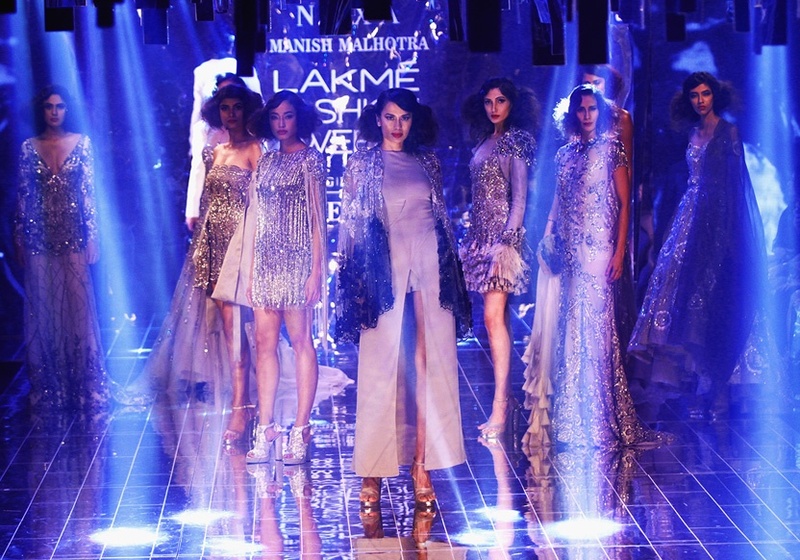 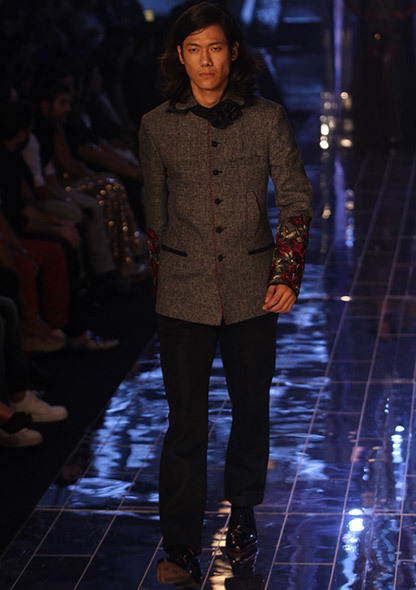 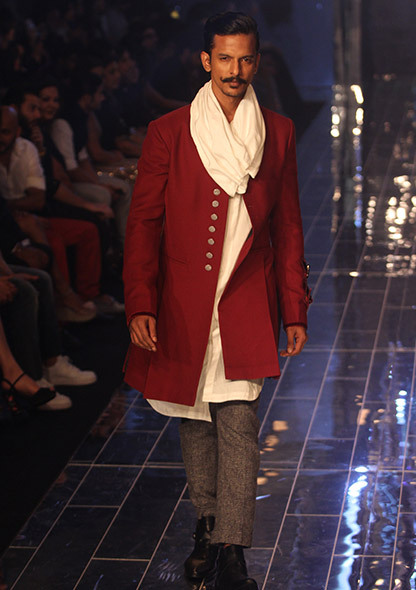 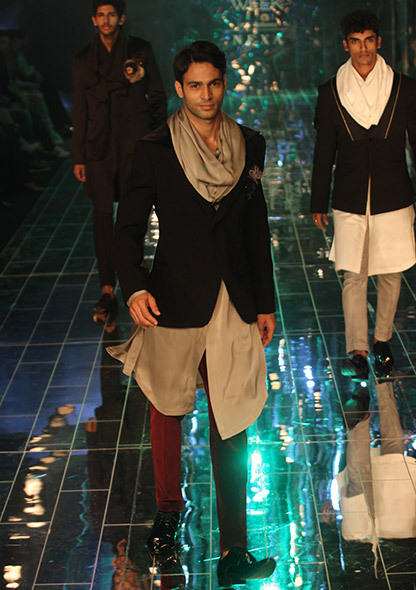 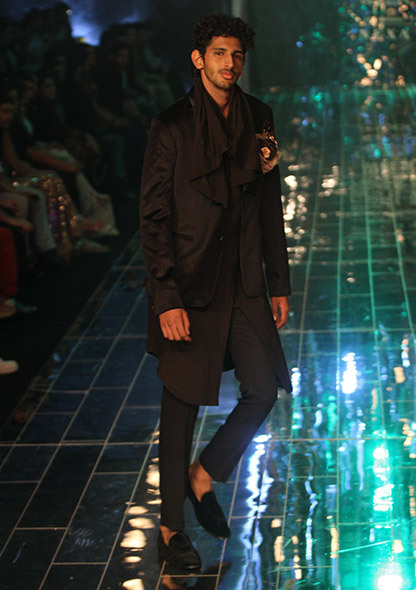 The spotlight was on cowl-necked asymmetrical hybrid silhouettes of kurta-shirts worn with trench-coats and embroidered jackets worn with velvet stoles. 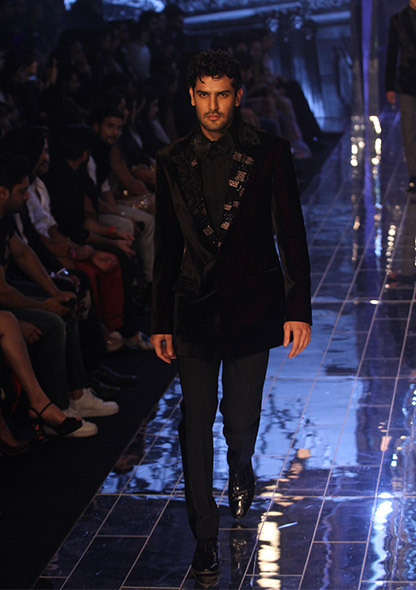 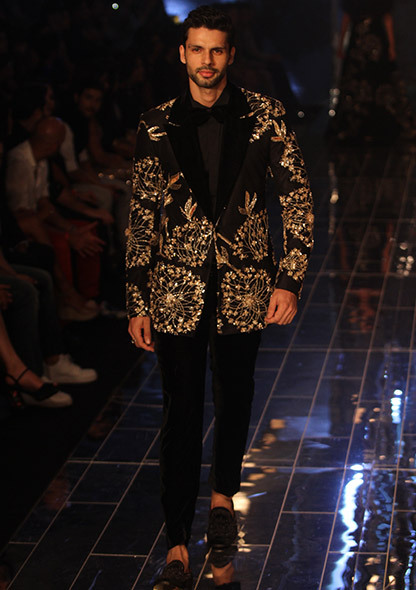 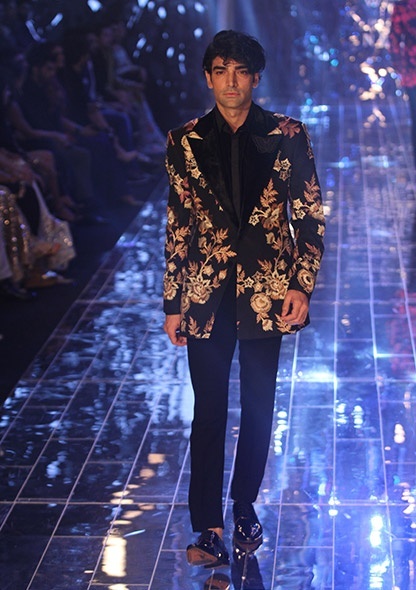 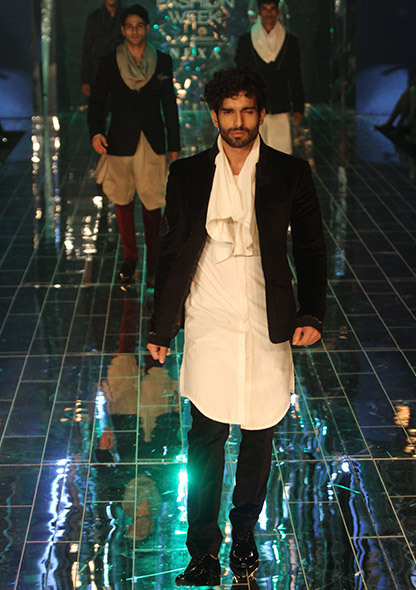 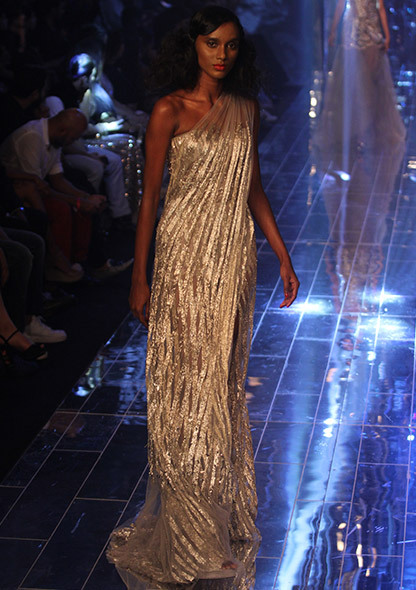 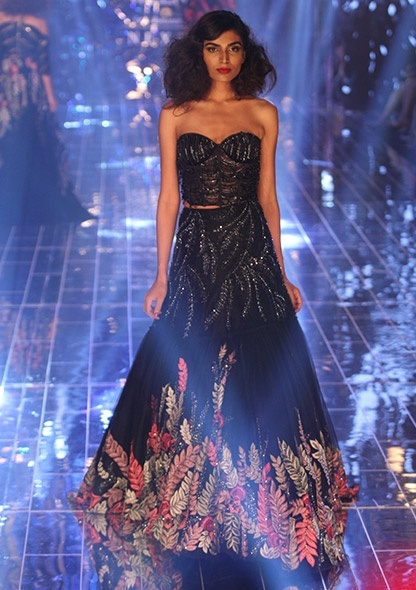 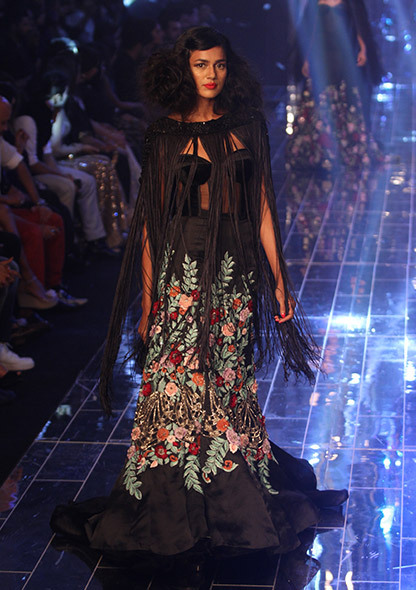 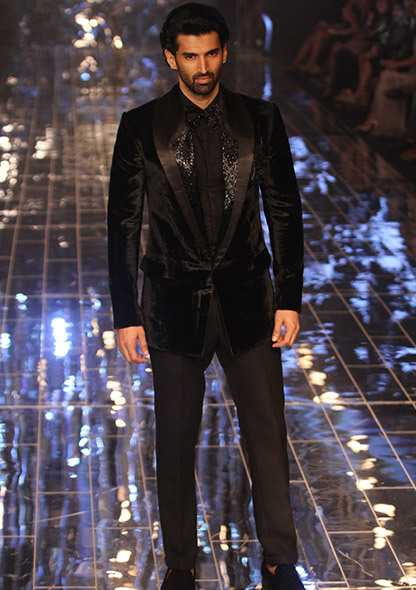 Feathered collars and lapels, net corsages and gold pocket-chains added an European dandy touch to the outfits.Jacqueline Fernandes and Aditya Roy Kapoor walked the runway in an embroidered tulle dress and black dinner jacket respectively.